On the left are two 16-port switches. Their individual ports are configured to be in the VLANs as indicated in the legend. As far as the devices plugged into those switches are concerned, they are configured as seen in the box on the right. 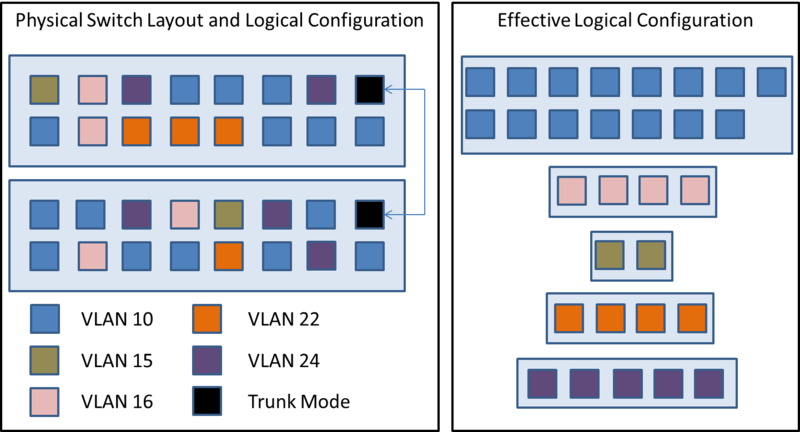 Ports connected to a particular VLAN have no direct connectivity to ports in any other VLAN, even if they happen to be on the same physical switch, but they can communicate directly with any other port in the same VLAN, even if it happens to be on another switch – provided that any other physical switches are connected in a trunk. Hyper-V’s virtual switches have the ability to emulate the above behavior, although it isn’t required. If you do nothing, all traffic traveling across a Hyper-V virtual switch will simply be untagged. If the physical switch that the physical network card you’re using to host your Hyper-V virtual switch doesn’t support 802.1q, then you won’t be able to use this feature. If the physical switch is 802.1q compliant, then you’ll need to set the physical port into trunk mode. For a Cisco IOS switch, this is done with the “switchport mode trunk” command; for other vendors, see the documentation. You don’t need to do anything in Hyper-V to enable trunking; it’s on automatically. However, you’ll need to configure individual switch ports for the desired VLAN. Follow the guide lines to configure Virtual Networking in Windows Server 2012 R2 and Windows Server 2016 Hyper-v role installed. A highly available clustered Hyper-v server should have the following configuration parameters or similar. There are two basic configurations for NIC Teaming plus new feature in Windows Server 2016. Switch-embedded Teaming enables the Hyper-V virtual switch to directly control multiple physical network adapters simultaneously. Compare and contrast this with the method used in 2012 and 2012 R2, in which a single Hyper-V virtual switch can only control a single physical or logical adapter. (This feature is in Windows Server 2016 and more on it on this link ). NIC teaming in Windows Server 2012 R2 and 2016 may also be deployed in a VM. This allows a VM to have virtual NICs connected to more than one Hyper-V switch and still maintain connectivity even if the physical NIC under one switch gets disconnected. This is brief overview and I hope it helps you in understanding this better. If you want a more detailed info on NIC and Switch Embedded Teaming check this great guide: Windows Server 2016 Technical Preview NIC and Switch Embedded Teaming User Guide.